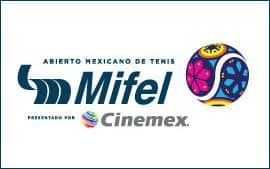 The Abierto de Tenis Mifel presentado por Cinemex will have a total financial commitment of nearly US$800,000, ranking it as the highest in its category in the Americas Region. The hard-court tournament debuted in 2016, with Ivo Karlovic taking home the inaugural title. The event showcases the unique natural beauty of one of Mexico's most important tourist destinations.